Pope Francis waves to the boy scouts gathered in St. Peter’s Square on June 13 in Vatican City. Breaking down Pew’s numbers by regularity of Mass attendance shows that dissent is more common among people who go to church less often. Weekly Mass attendance is a natural place to divide Catholics by practice — skipping weekly Mass is a mortal sin, so Catholics who don’t attend as often are likely to view the church differently than those who show up every Sunday. Unsurprisingly, dissent is a lot more common among Catholics who are operating at a distance from the church, but substantial shares of weekly Mass-goers share those opinions. Although dissenters are often tarred as “Cafeteria Catholics” who pick and choose from among the church’s teachings, without much thought for the whole, the dissenting Catholics that Pew surveyed seemed fairly confident that the changes they support will wind up being viewed as orthodox and applicable to everyone. On every controversy that Pew included in its survey, at least half of dissenting Catholics expected that their desired change would probably or definitely come to pass by 2050. Catholics who hoped that current teachings would remain unchanged were similarly confident that the church of the future would be the one they wanted. On all issues, fewer than 40 percent of Catholics holding to current orthodoxy thought a change was likely. Dissenters who attend Mass regularly turn out to be more optimistic than dissenters with irregular attendance that the church will wind up making the changes they want. 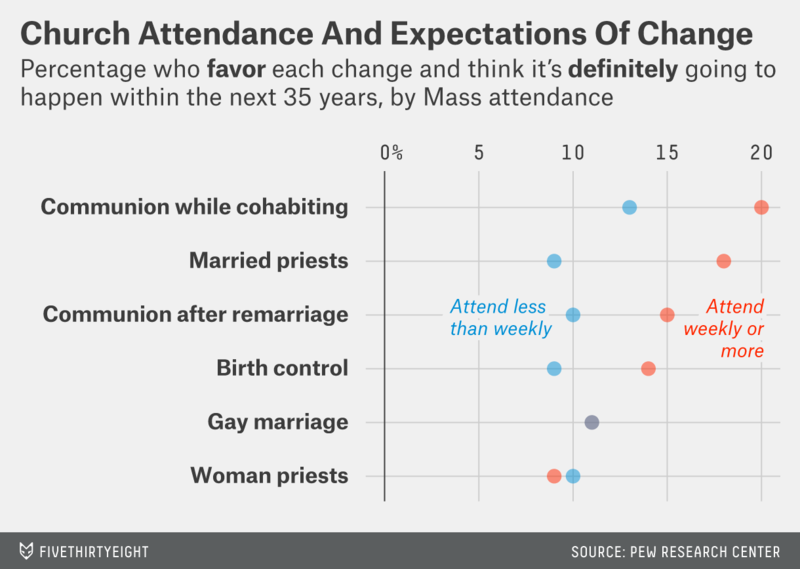 Catholics who go to Mass regularly and want change were about 4 percentage points more likely, on average, to say their desired change would definitely happen, compared with Catholics with more irregular attendance records. Faith that the changes they want are likely, or even definitely, going to happen may be part of what keeps these parishioners within the church. If they expect that their dissents will eventually be adopted by the Vatican, they may as well stick around while they wait for the change. With both sides optimistic that they’ll prevail, someone is bound to wind up disappointed. But in the meantime, Catholics trust the church of the future, while sometimes ignoring the one that exists in the here and now. CORRECTION (Sept. 5, 1:17 p.m.): Two previous versions of the second table in this article incorrectly listed the share of Catholics who agreed with current church teachings but expected them to change. The table and the text describing it have been corrected. The data used in this piece is from Pew’s report titled “U.S. Catholics Open to Non-Traditional Families,” but the specific crosstabs comparing expectations of change with the desire for change were not in the published report and were provided to us by Pew upon request.